We know that sprinkler systems can be a little confusing. Whether you're locating irrigation valves, understanding what wire does what, or trying to understand your old controller, we're here to lend a hand. The following overview will help you understand what you're working with and become skilled (and efficient!) in lawn maintenance. Read below about the basic components of a typical sprinkler system that is run using city water. If you want to learn more, explore the resources listed along the way! In typical sprinkler systems, the water is distributed in only one direction: from the city to you. Sometimes the direction of the water can be reversed accidentally, so the backflow is in place to prevent any contaminated water from traveling back to your clean water supply. 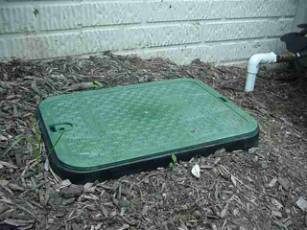 The backflow is turned on during the spring when you begin to water your lawn and subsequently turned off in autumn when you are finished watering your lawn for the season. 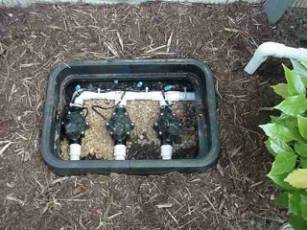 In most cases, your sprinkler valve box will house your manifold and valves. Occasionally valves will be above ground. Valve boxes are generally around the permitter of your house - so when searching for your valves, start there! The manifold distributes water to your valves, which are all individually connected. In the image below, the manifold is the main white tubing that branches off from the long singular tube. Here's a short video on how to manually open a sprinkler valve. A pump valve will automatically regulate the start-up and shutdown of water flow to minimize system hydraulic surges. 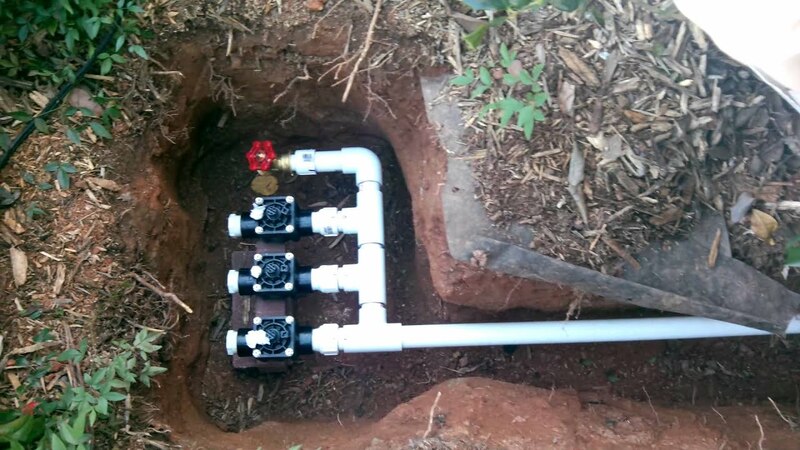 A master valve is an electric valve installed at the main water supply for the irrigation system. A master valve will greatly reduce any water loss due to a leaky station valve because the leaky station valve can only leak while the master valve is providing pressure to the system. 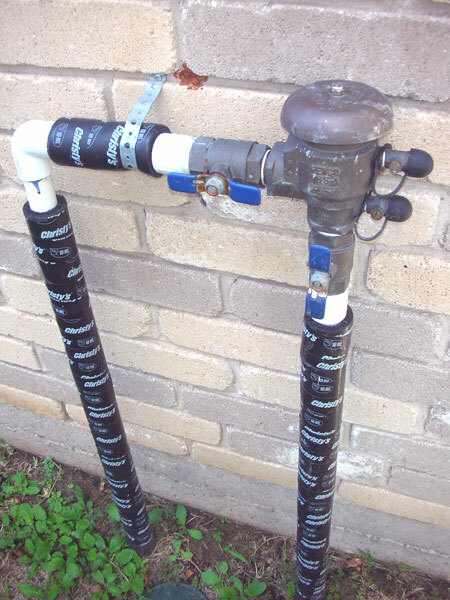 Also, if you damage the irrigation main line, a master valve will control water loss so the main can be repaired without shutting off the water supply. An electric master valve is typically the same type of valve as you would use for your zone valves, but is installed upstream from the zone valves on the main line. It is connected to the "master" or "pump" connection in your controller. For Generation 1 controllers, this is the blue terminal in the wall mount. For Generation 2 controllers, find the terminal marked "M". 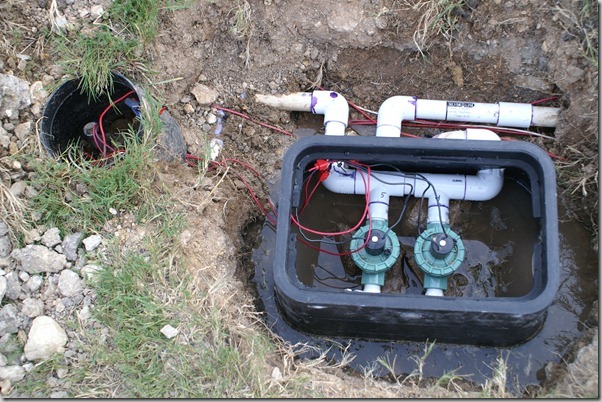 In the image below, the master valve is in the small circular box to the left of the main sprinkler box. These valves are powered by 24 volts (VAC) from your controller. When your controller turns a valve on, it sends 24VAC to the solenoid. The solenoid has two wire leads extending from it. One wire attaches to the “hot wire” that receives the 24 VAC from the controller while the other wire attaches to a “common wire” that acts as a neutral/return wire. The “common wire” is run in series and is connected to all the valves in your system. The “hot wires” are run from each zone at the controller to each valve in your lawn/property. Therefore each zone is operated independently through the controller. The image below shows the parts within a solenoid valve. For our purpose sprinkler heads are categorized into three types with the average precipitation they emit, calculated as inches/hour. (These calculations are averages that we have gathered. They may not specifically represent your sprinklers). If you've got a valve stuck open, you can use Rachio to stop the water flow. From the Rachio app: Press the stop button near the bottom of the Home screen. From controller (G2, R3): Hit the physical stop button. If the above do not work, unplug the controller. If unplugging the controller does not work, you will need an irrigation professional to come out and fix your irrigation system. You can find a Certified Rachio Pro here. Check out Irrigation Tutorials and search through the helpful resources provided there. This website is not affiliated with any irrigation, sprinkler, or drip equipment manufacturer, supplier, or installer, so all tutorials are independent and not biased toward selling a particular service, product, or brand. How do I Re-activate my Sprinklers? How to stop Water Hammer?